Wonderful neighbourhood door-to-door traditions like Christmas carolling and mail delivery are now sadly outmoded. I may not lament too much on picking my Christmas cards out of a cold metal box, but I do miss hearing that soothing balm of carol-singing after the assault on the human spirit that occurs at this time of the year. Along with a church full of fellow Christmas music devotees, I managed to get my ‘carol-singing fix’ this weekend at Kerrisdale’s Ryerson United Church where we were treated to a delightfully, light-hearted programme played by a fine local choir. Taking the ‘stage’ the nine women and ten men, began appropriately with a joyous medley of Christmas Madrigals sung in unison with female members in front and the men standing behind. The next piece was additional to the original programme. Beautifully sung in contrappunto with Latin text, Morten Lauridsen’s responsorial chant O Magnum Mysterium is sufficiently contiguous to Christmas music, that conductor Jon Washburn obviously felt it should be included in the concert repertoire. Daniel Gawthrop’s Pie Carols are a mouthwatering set of carol parodies (apologies for the awful pun). In keeping with food being an integral part of the Holiday Season, Gawthrop takes popular carols and transposes the texts with smart poems. For instance: the words to Good King Wenceslas are replaced with: “Apple pie is noble fare, worthy of your palate.” This selection of half dozen Christmas parodies was a huge hit with the audience. 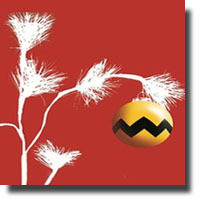 Of all the Christmas specials that return to television programming during the holiday season, none has been more enduring than A Charlie Brown Christmas - and for good reason. San Francisco pianist Vince Guaraldi’s jazz infused scores composed for the television specials have become synonymous with Charles Schulz’s famous comic strip. The choir is joined by bassist Jodi Proznick and pianist Michael Creber, who also has a cameo as Peanuts character Schroeder, as well as actors Pippa Johnstone, Peter Carlone and John Voth reading for the other characters. Creber gets the chord progressions in the classic "Linus and Lucy" theme spot on, likewise the ‘Schroeder arrangement’ of “Jingle Bells.” Guaraldi’s music is tenderly evocative of Schulz’s gang of eight-year-olds who make you think as well as laugh at the downside of Christmas. The pairing of a popular Christmas story and a choral concert was a unique way to start Christmas festivities.